These index funds can give you exposure to specific sectors like video games, foreign-listed companies, and high-yield dividend stocks. The greatest test of an investor's resolve is staying invested when stock prices are on the decline. Owning stocks in companies can be especially hard, because thoughts that your investment thesis is breaking down starts to creep into your mind, or maybe just because you don't like seeing large negative numbers on your brokerage statements from time to time. One way to mitigate the risk of owning single stocks is to buy index funds. These are low-cost options that spread your money over several companies all at once and help you stay invested through the ups and downs of the market. You could consider this a golden age of index funds, because there are so many on offer that you can be as broad or as targeted as you like. We asked three of our Motley Fool contributors to each highlight an index fund they see as an attractive investment to keep you in the market. Here's why they picked the ETFMG Video Game Tech ETF (NYSEMKT:GAMR), the Vanguard FTSE All-World ex-US Small-Cap ETF (NYSEMKT:VSS), and the Vanguard High Dividend Yield ETF (NYSEMKT:VYM). Rich Smith (ETFMG Video Game Tech ETF): Did someone say index funds that keep you in the "investing game"? Well right off the bat, that gets me wondering if there's actually an index fund devoted entirely to gaming -- specifically, video gaming. And as it turns out, there is: the ETFMG Video Game Tech ETF, which was established in 2016 and which aims to mimic the performance of the EE Fund Video Game Tech Index. Now mind you, ETFMG Video Game Tech ETF isn't the cheapest index fund on the planet. Its expense ratio of 0.82% won't break the bank, but it is a bit higher than the average 0.73% expense ratio for index mutual funds, and it's a whole lot more expensive than the average 0.23% expense ratio for most ETFs. On the other hand, ETFMG Video Game Tech ETF also pays a modest 1.2% dividend, which should more than cover the cost of its expense ratio. Why would you buy it? Primarily, I suspect, as an easy way to invest in 36 of the top video gaming stocks around the world -- everyone from America's Activision and Electronic Arts to Japan's Capcom, France's Ubisoft, and South Korea's Pearl Abyss -- all in one go. For the chance to cover the whole world's gaming industry and add some international diversification to your portfolio at the same time, ETFMG Video Game Tech ETF might be worth the price. Tyler Crowe (Vanguard FTSE All-World ex-US Small-Cap ETF): Being an investor in the U.S. gives you one of the largest investing sandboxes to play in around the world. Combined, the NYSE and NASDAQ exchanges have a market capitalization of about $26 trillion, representing about 37% of the global equities market, according to Visual Capitalist. With such a large, diverse, and liquid market, it's easy to find lots of investment opportunities without going through the headaches of high-cost transaction fees for foreign stocks and having to deal with tax rules outside the U.S. The trade-off for investing only in the U.S. is that you are giving up the opportunities found in the other 63% of the global equity market, where you can find dynamic companies across both mature and fast-developing economies around the world. Thanks to the boom in index funds, though, there is an equity traded fund for this very situation: the Vanguard FTSE All-World ex-US Small-Cap ETF. By investing in this particular ETF, you get a lot of the benefits of investing in high-growth opportunities outside the U.S. without most of the hurdles typically associated with investing in non-U.S. equities in your brokerage account. 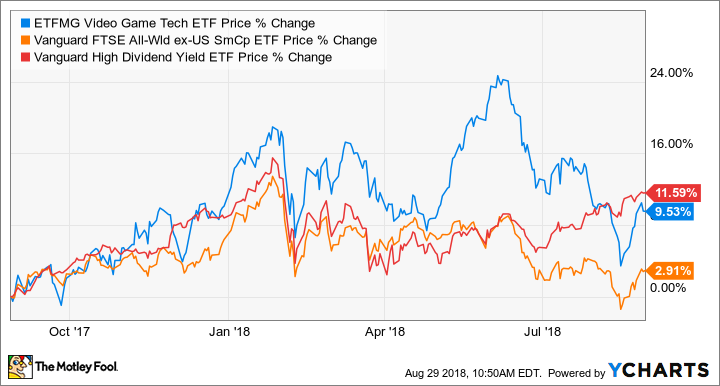 Even though its expense ratio of 0.13% is higher than larger ETFs like those that track the S&P 500, it is still a low-cost option that doesn't have the higher trading fees associated with investing in non-NYSE- or NASDAQ-listed stocks. Also, by investing in 3,578 different stocks across several geographies, it provides exposure to high growth -- it has returned 11.97% annually since its inception in 2009 -- while significantly reducing the risk of owning a small handful of often volatile small-cap stocks. No investment is perfect. This particular ETF has higher exposure to volatile emerging market economies and the ups and downs of foreign currency. However, it does solve a lot of the problems associated with investing in the global equity market and opens up a whole new world of stocks that won't be found on the American exchanges. Keith Noonan (Vanguard High Dividend Yield ETF): When selecting dividend stocks individually, you'll typically want to look for companies that haven't cut or suspended their payouts and appear positioned to keep the distributions flowing. Even with those selection criteria, there's still the possibility that stocks you've chosen will drop their payouts and leave you short on your expected dividends. For investors looking for lower-risk income investments, dividend-focused ETFs can be a great portfolio addition because they mitigate that risk through diversification -- and Vanguard's High Dividend Yield ETF is a top candidate in the category. Vanguard's premier dividend ETF has a yield of roughly 3.2% and bundles 408 stocks in a single security, with its top five holdings by weight being JP Morgan Chase, ExxonMobil, Johnson & Johnson, Wells Fargo, and Chevron. The fund's holdings are made up of stocks on the FTSE All-World Index that pay above-average yields, so investors can be confident that the yield on the fund will be higher than that of the broader market. Vanguard's funds are also known for having comparably low fees, and the expense ratio on its High Dividend Yield ETF is in line with that reputation -- coming in at 0.08%. That means that just $0.80 would be deducted from your annual dividends for every $1,000 you had invested in the fund, which the investment management company says is 92% lower than the fees charged by the average fund consisting of similar holdings. With its combination of diversified market exposure, above-average yield, and low expenses, the Vanguard High Dividend Yield stands out as a dependable vehicle for investors seeking regular income generation.